During the cold winter months, it can be very difficult to stay warm living on the streets. Winter is the hardest time for our homeless community. When the temperature dips below freezing it creates a severe risk for hypothermia, and the consequences can be fatal. 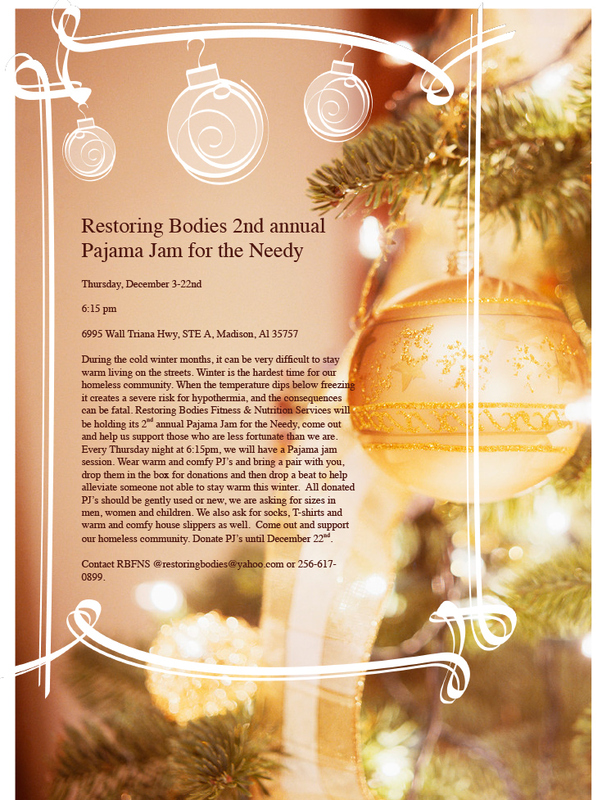 Restoring Bodies Fitness & Nutrition Services will be holding its 2nd annual Pajama Jam for the Needy, come out and help us support those who are less fortunate than we are. Every Thursday night at 6:15pm, we will have a Pajama jam session. Wear warm and comfy PJ’s and bring a pair with you, drop them in the box for donations and then drop a beat to help alleviate someone not able to stay warm this winter. All donated PJ’s should be gently used or new, we are asking for sizes in men, women and children. We also ask for socks, T-shirts and warm and comfy house slippers as well. Come out and support our homeless community. Donate PJ’s until December 22nd. Contact RBFNS @restoringbodies@yahoo.com or 256-617-0899.